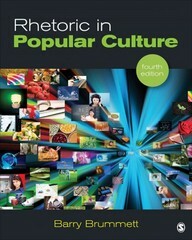 Rhetoric in Popular Culture 4 Edition The Fourth Edition of Barry Brummett’s Rhetoric in Popular Culture provides readers with in-depth insight into the techniques of rhetorical criticism to analyze the full spectrum of contemporary issues in popular culture. From movies, magazines and advertisements, to social networking sites, music videos and television shows, Dr. Brummett presents key rhetorical concepts and applies them with critical analysis to a variety of exciting examples drawn from today's popular culture. Moving from theory to practice throughout the text, Brummett links concepts in an easy-to-understand way. Rhetoric in Popular Culture covers the concept rhetoric, itself, as well as its place and dynamic change in history, and offers methods to effectively employ rhetorical criticism in daily life. The new edition includes pertinent critical essays and case studies that show readers how the critical methods discussed can be used to study the hidden rhetoric of extended texts, and more.